We’re still reeling from this weekend’s shooting at Second Saturday. Although the eruption of violence did not come as a complete surprise given the size of the crowds, none of us here predicted anything like this. Our thoughts are with the victims and their families and we hope that this tragedy will inspire actions that will make Second Saturday safer for all. What is the answer? How do we make Second Saturday safe and fun for all? Like most Midtowners, we’ve been both excited and concerned by the explosive growth of this event. Seeing the neighborhood full of people has been a joy, even if the crowd’s sometimes surly behavior has not. As Second Saturday has shifted from its initial focus as an art event to more of ‘block party,’ many Midtown residents have voiced their displeasure. Our own Bill Burg has often been on the frontlines of these discussions- relating his own experiences with drunks in his yard at 4AM, cleaning up their trash and even washing their piss off his porch. Ironically, the homeless population that is so often the subject of public scorn has caused Burg far less trouble than the drunken suburbanites who come to Midtown for the party. Yesterday, MBA head Rob Kerth, Midtown Neighborhood Association’s Matt Piner, and Sac PD captain Dana Matthes were guests on KXJZ’s INSIGHT program, hosted by Jeffrey Callison. The good news is that no one at the city, from the Mayor on down, is suggesting the same drastic reaction that killed K Street’s Thursday Night Market. How they will handle the event from here on out is still an open question. So, we offer an open forum here: What do YOU suggest? What do you like, or not like, about Second Saturday? What will make it better? This Friday, enjoy what is sure to be an exciting night at the historic Crest Theatre. 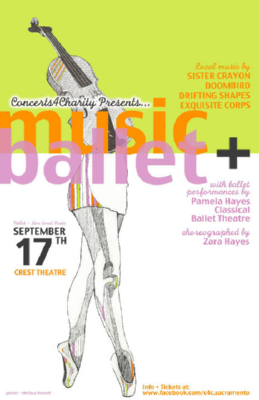 Concerts 4 Charity, in collaboration with the Pamela Hayes Ballet Theatre have put together a special live production featuring ballet performed to live music by Sister Crayon, Drifting Shapes, Doom Birds, and Exquisite Corps. This is sure to be a memorable event. The costume design for the ballet was created by local designer, Lindsay Rickman. Her innovative cut-up construction, use of bright colors and unique graphics are well applied to stage production, creating original and bold ensembles made expressly for this fund-raising performance.